Party decorations just aren't complete without hanging some garland! Whether your decorating for the holidays, a birthday party or a special event like prom or a wedding, you can't pass up or over look the garland! We have all the cheap garland you could want at discounted prices! We offer several different types of garland from: fringe festooning, tissue leaf garland, to metallic garland. All of these types of garland come in hundreds of colors and textures. We also offer seasonal garland such as colored leaf garland to hang in the fall and floral garland to hang up in the spring. We also have Tissue Apple Garland that can be hung up around the classroom! Cheap garland is the best way to answer the question of how to decorate a stairway, with what to drape around the walls or ceilings and even what drape around the sides of tables. Whatever event you are planning to decorate for you can't go wrong with adding some festive color by hanging up some garland. 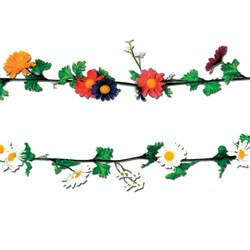 We have exactly the kind of garland you’re looking for right here at PartyCheap.com! Using garland at your next big party or event instantly makes your home or event space even more classy than it already is! Try out our silver barbed wire garland for a western themed party! Or try out our Heart Garland for Valentine’s Day. Struggling to think of different ways to use garland around your home or event space? Browse our website and in just minutes you’ll be back on track! No matter what the occasion we are sure to have something to match! Look into our Religious Easter Egg Garland which has a cross cut out of each and every Easter egg. We also offer bulk discounts on select items! It is our goal to provide our loyal customers with the best possible products for the lowest possible prices. And of course we always love hearing from our very loyal customers! If you have any questions or ideas for new products feel free to give us a call or leave us a message! We’d be happy to hear from you! And who knows? You might just see your idea on our website in the near future! No matter what kind of party garland and other party supplies you’re looking for we’ve got you covered! We’re PartyCheap.com and we know how to party!